To say a person, any person, irregardless of occupation, cannot wear icons of their religion, is a direct violation of two clauses of the 1st Amendment; the Freedom of Religion, and Freedom of Speech; Texas vs Johnson includes protected speech to mean "expression" (anything that can reasonable be interpreted as having a message) as well, including behavioral and symbolic speech, such as artistic methods and worn icons. Schools should be inclusive of all religions, not a religion-free zone. This is protected under the freedom of expression. Students are permitted to wear what they like unless their attire is vulgar or lewd (Bethel School Dist. No. 403 v. Fraser, 478 U.S. 675 (1986)), promote illegal drug use (Morse v. Frederick, 551 U.S. 393 (2007)), or are likely to cause serious disruption at school or violate other students’ rights (Tinker v. Des Moines Independent Community School Dist., 393 U.S. 503 (1969)). Teachers should be granted the same freedoms. Such a policy violates the teacher's freedom of religion. Of course, there are examples where courts have stepped in, but a school cannot, and should not, ban teachers from wearing religious symbols. A majority of "public schools" are funded by governments, but the "establishment clause" pertains to laws -- and no law has been passed mandating the wearing of religious symbols or acknowledging a religion. 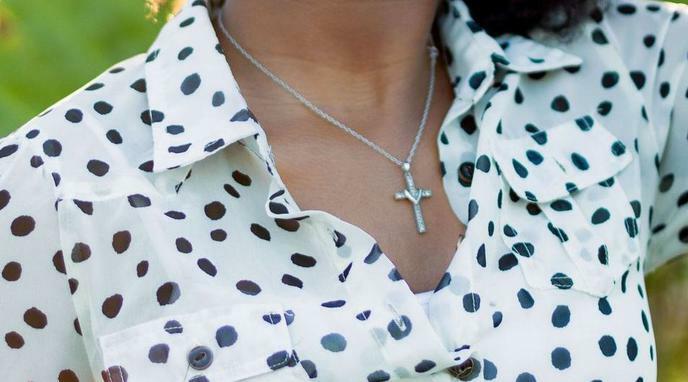 Teachers wearing religious symbols would not negatively impact students' free choice. In fact, students' freedom of religious choice may be enhanced by awareness of people in their community who follow different faiths other than that of their parents. If the claim "Teachers must wear religious symbols while teaching at school" violates basic human rights, then the claim "Teachers should not be allowed to wear religious symbols at school" also violates basic human rights. As long as the manner in which they display their religious object is not tied to the education system the teachers, as individuals, should still have the same protection under the constitution which supports the freedom to practice their own religion. That does not mean that the government needs to support wearing religious symbols -- allowing Islam does not mean that the government has to support circumcision. There are many practises whose legality is entirely dependent on context. This assumes a US-centric world-view. Other countries' constitutions have very different stances on this matter and that should be taken into consideration. The Constitution forbids the government from establishing religion. Actually the constitution protects a person’s “free exercise” of religion. While they might be partially federally subsidized, schools are not federal property, nor are teachers federal employees. Therefore, barring them from wearing religious symbols could be considered unconstitutional.